I was really hesitant to make this because I thought wouldn’t like the taste of these flavours together. I remembered after seeing the recipe for it here that I’d previously enjoyed lemon white chocolate chip cookies and so I resolved to give this recipe a go once I’d gathered all the ingredients. I wasn’t sure what to expect for the filling. 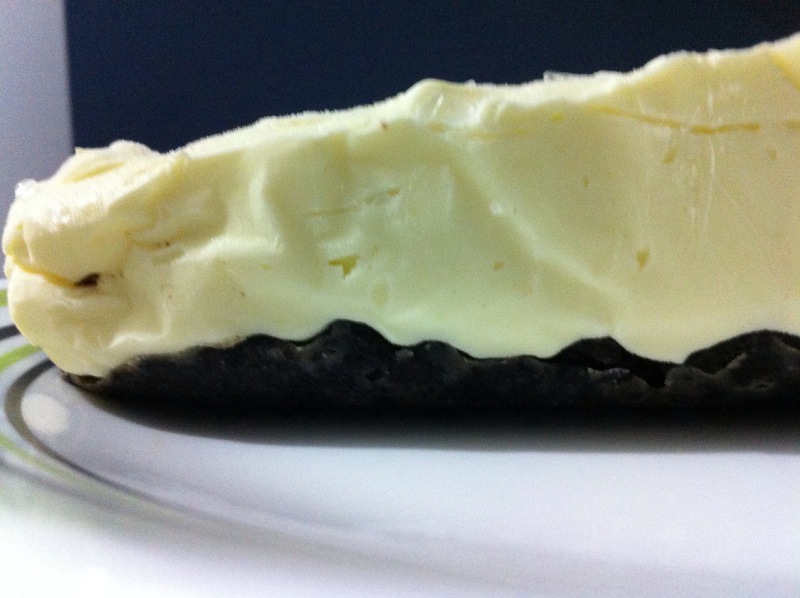 I assumed that adding the white chocolate would ‘steal’ from the true cream cheese taste that makes me love chilled cheesecakes but I found that although the mixture required no gelatin because the chocolate thickened the consistency, it did not overpower the taste. 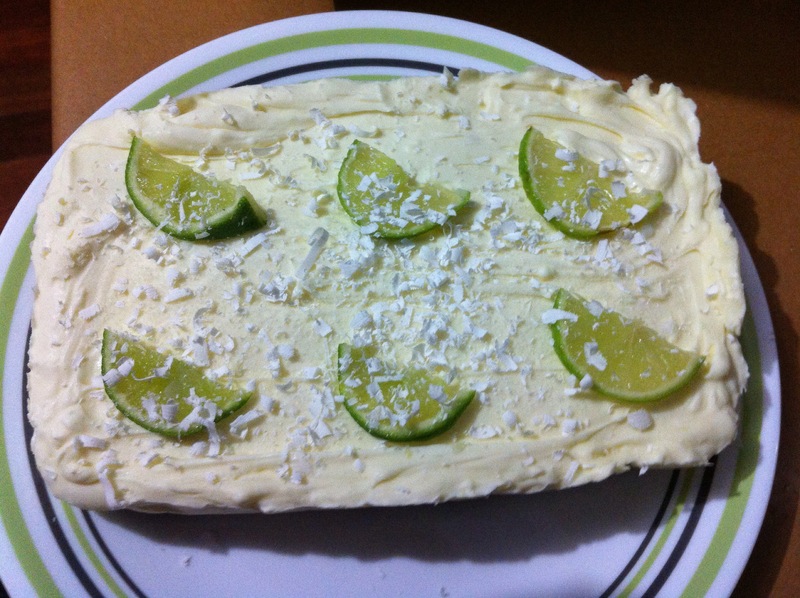 Even with the ratio of lime juice and zest to white chocolate, the acidic citrus taste did not diminish the sweetness of the filling either, but gave the cake a nice fragrant quality and subtle tang. If you’re looking for a really rich dessert then go ahead and try this should the ingredients be available to you. It even looks appetising! A key factor that enticed me to attempt making it. 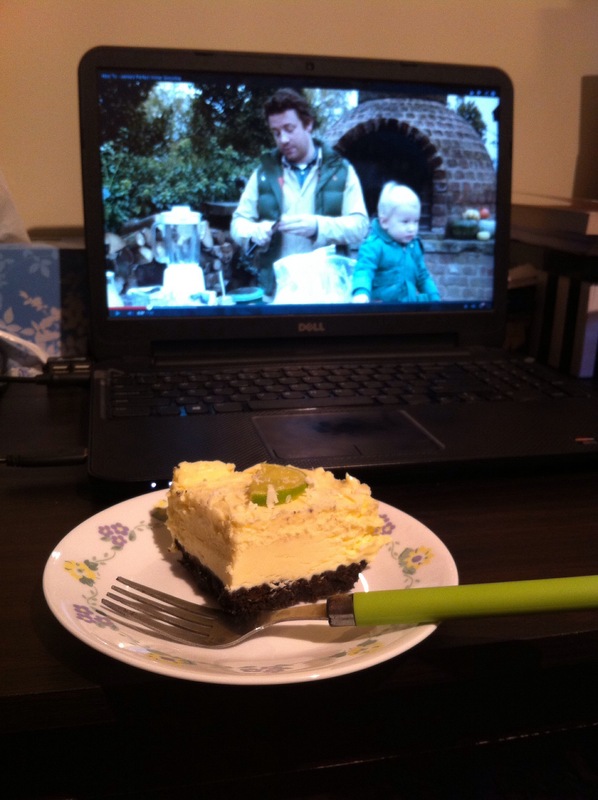 I enjoyed my first slice while watching Jaime Oliver on YouTube (as seen in one of the pictures). I’ve watched most of Nigella’s clips already. 😦 I laughed so much during this recipe because the child didn’t say “Hello” to the camera and Jaime was like “This is what happens when you put kids under pressure” in an offhanded way. I posted a status on my Facebook profile and page about making this cheesecake so at uni yesterday a few friends asked me how the dessert had turned out. It was then I realised that in my morning rush I’d forgotten to check the state of the dessert. I didn’t even remember straight away when I got home. But when my mother starts asking “How come the bus wasn’t on time? How much traffic was there really?” it gets distracting. Update: My mother and older brother had some cheesecake before their biriyani lunch and they both really liked it. 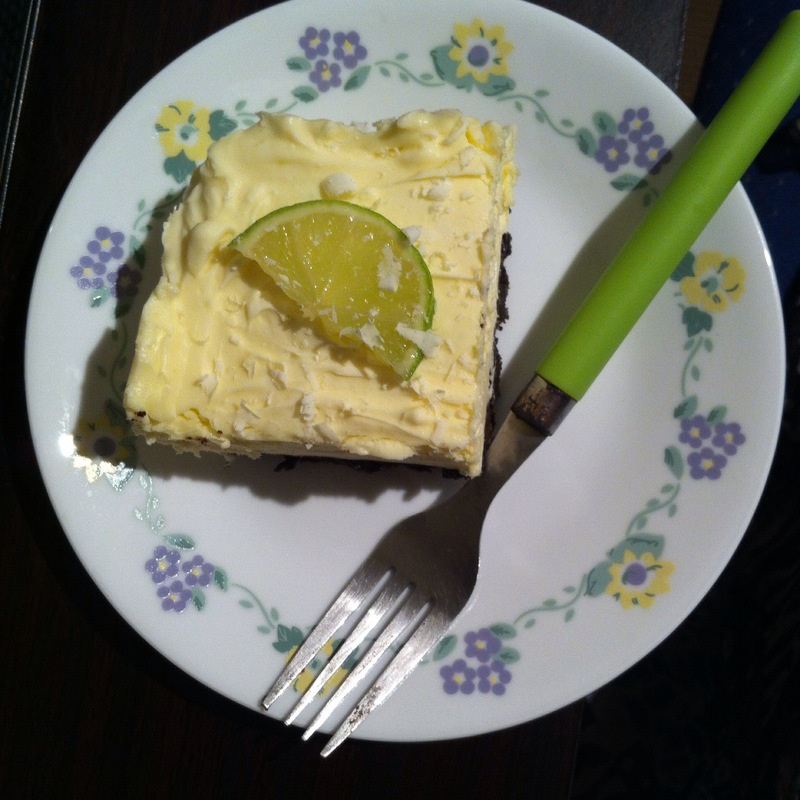 My brother Ivan said it looked and tasted like something from a cafe – a comparison that always gets a smile from me. 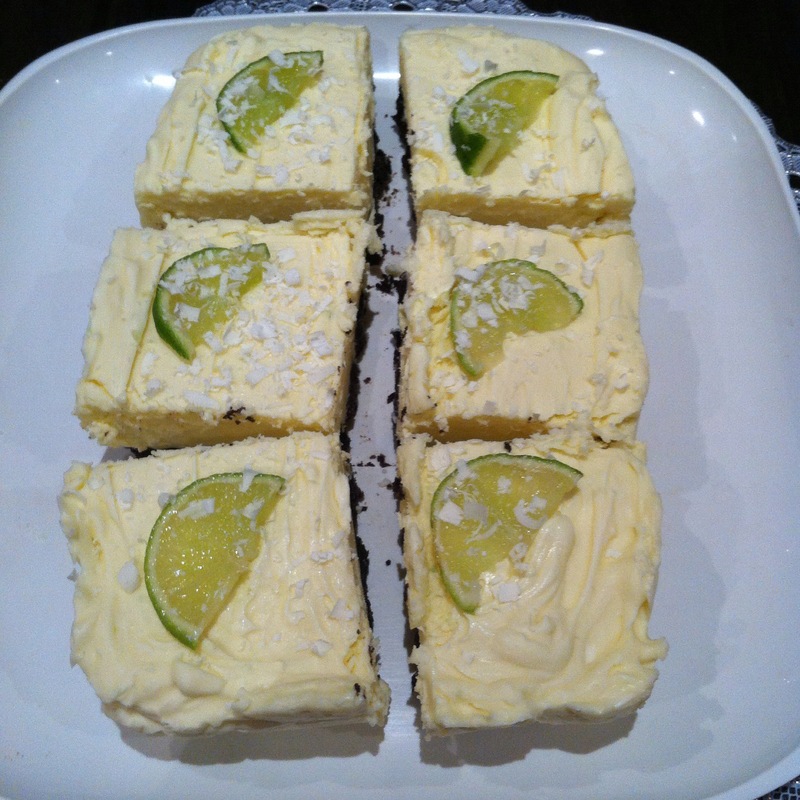 🙂 My mum was really impressed with how the filling tasted as she’d doubted the lime and white chocolate combination and has asked me to make this for her parties in future. Allow cream cheese to soften at room temperature before starting. It will be easier to beat the additives into the filling. 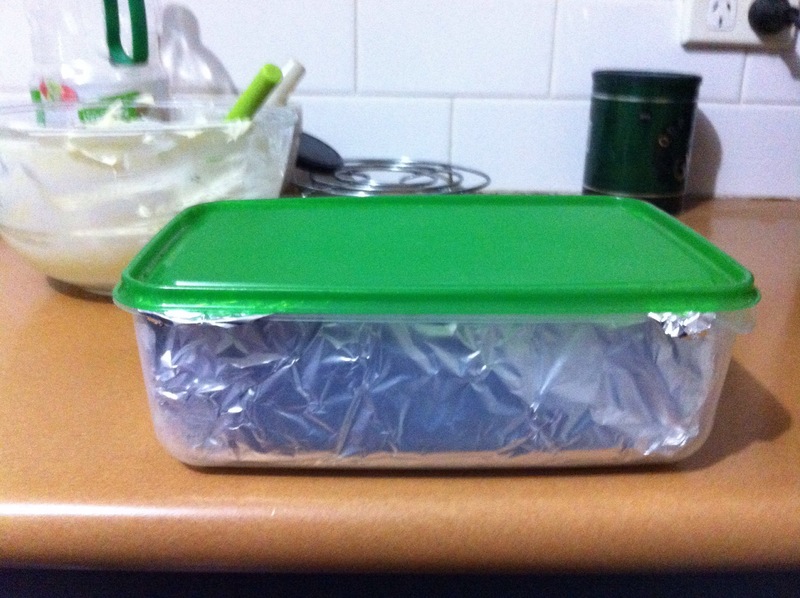 Line a baking pan with foil, extending over all sides. You can use square or circular. 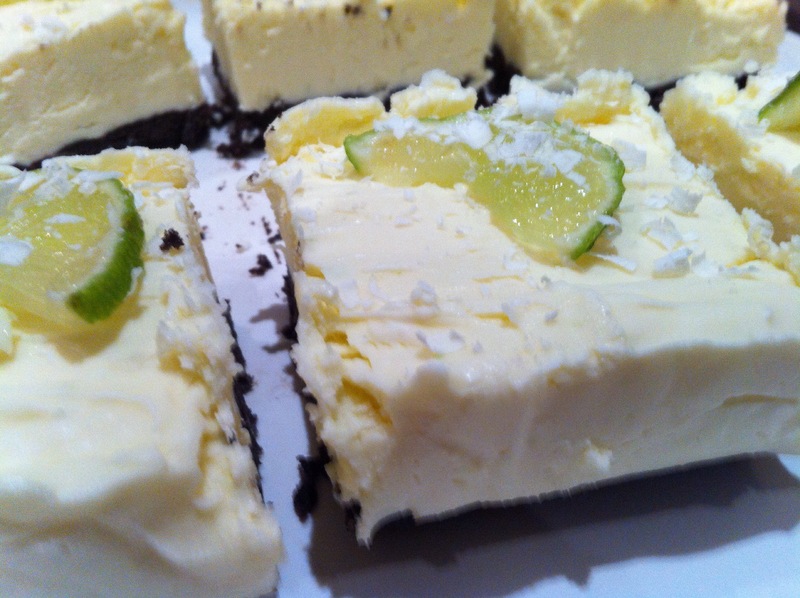 I opted to use just a container since this cheesecake requires no baking. Grind cookies in a food processor or double bag and crush with the bottom of a glass (this second method takes longer). 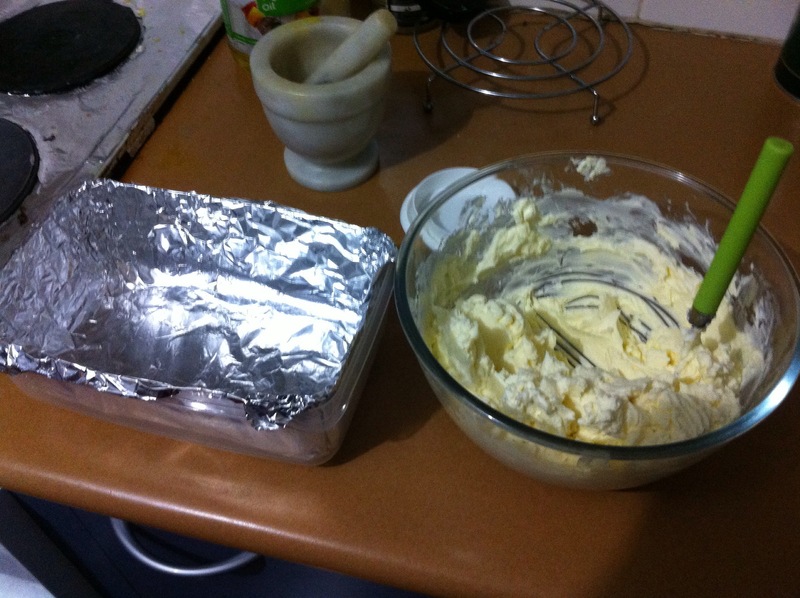 Microwave the butter and mix up the crushed biscuit with it. Press the moist biscuit mixture firmly onto bottom of prepared pan or container. Chill the biscuit base in the fridge while making the filling. In a double boiler stir the broken up pieces of white chocolate over the boiling water until melted and smooth. Remove bowl from over water. 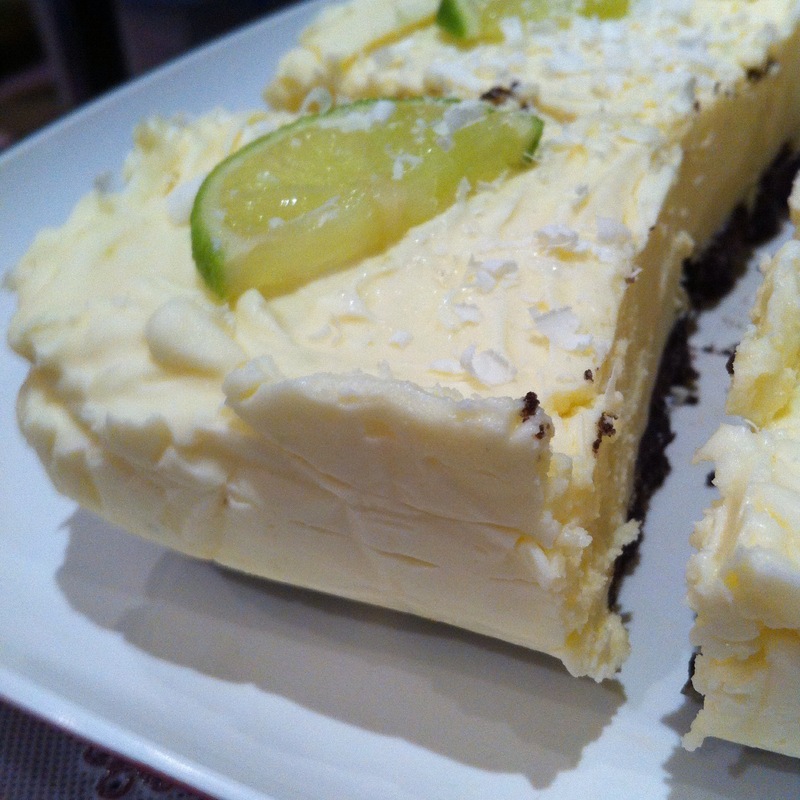 Beat cream in bowl until peaks form, then add and beat the cream cheese, sugar, lime juice, and lime peel until smooth. Stir in the melted white chocolate. Pour onto the prepared biscuit base. Smooth the top with the back of a spoon. Cover pan in plastic wrap (or if using a container, use the lid for it). 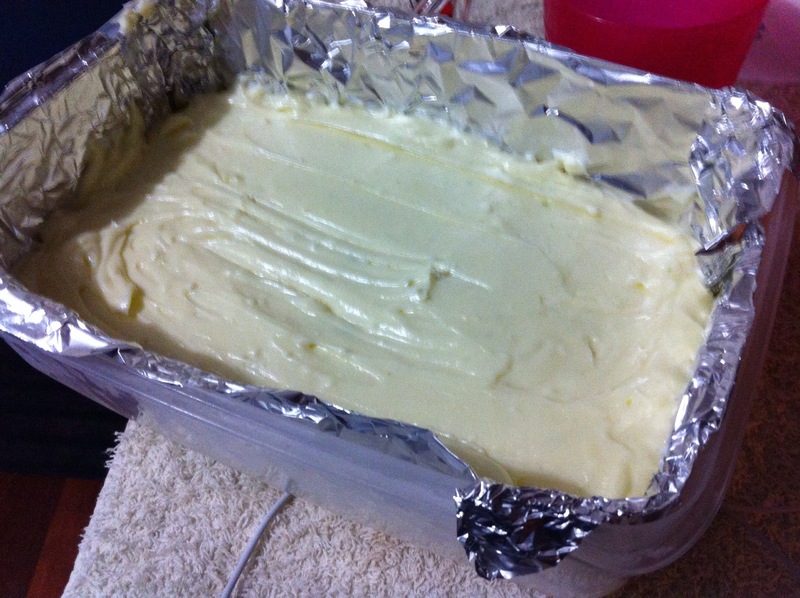 Freeze overnight or for 4 – 5 hours. 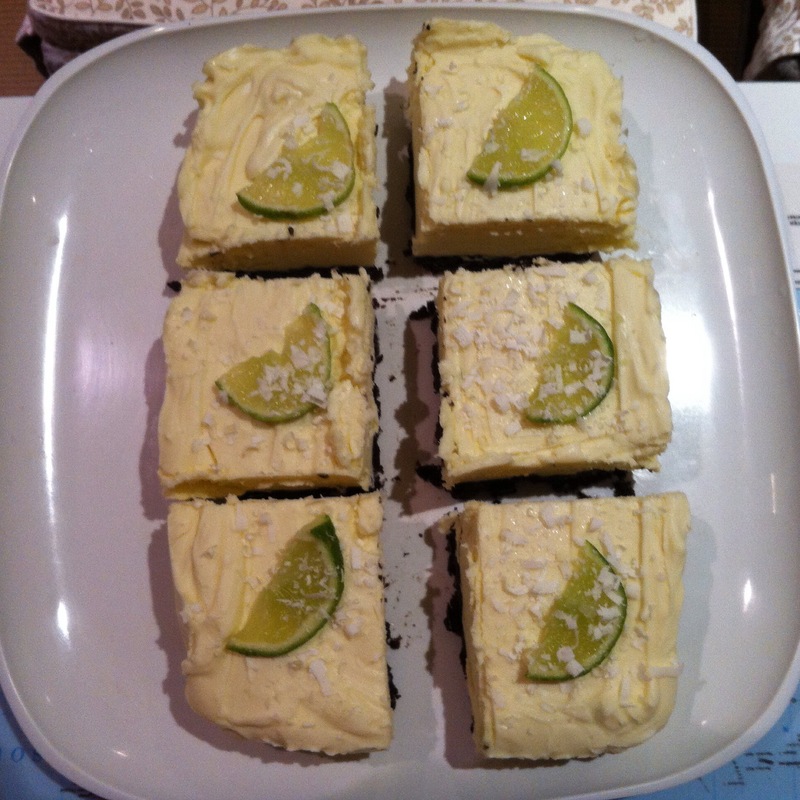 Garnish the top of the cake with chocolate or white chocolate curls or shavings and slices of lime if desired. I forgot to chill the biscuit base before making the filling so I shoved it in the freezer to speed things up before pouring on the filling. The chocolate in the filling binds the cream and cream cheese so this chilled cheesecake requires no gelatin or similar additives. The original recipe states to chill the cheesecake but I opted to freeze it to maximise its thickness before slicing and serving. I thawed it for 20 – 30 minutes prior to serving. I did not return uneaten portions to the freezer. 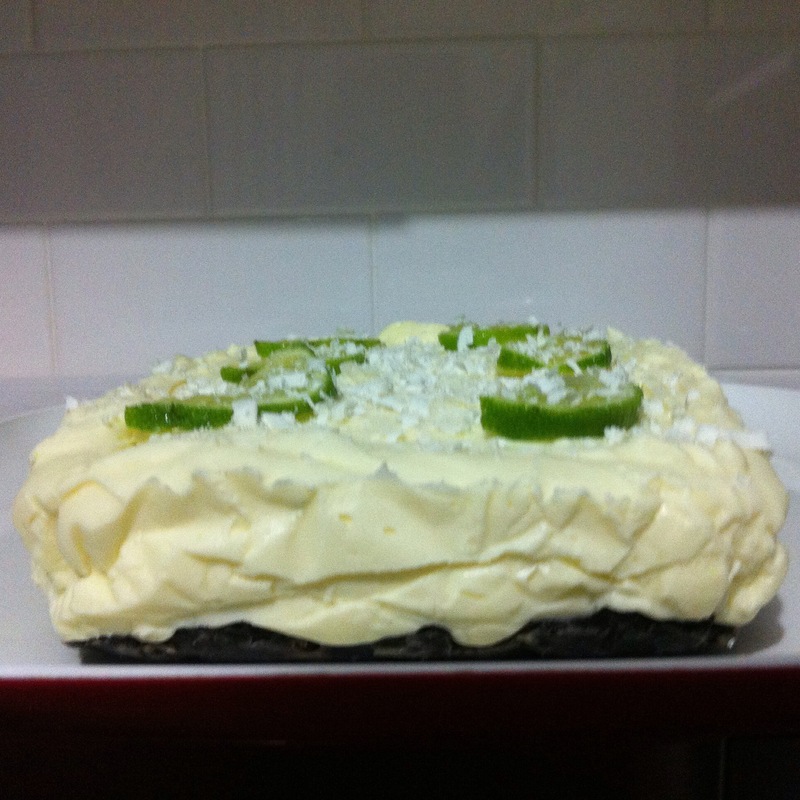 I just stored it in the fridge as the filling kept its shape. Previous Post Creamy parsley and mushroom pasta. Next Post Avocado and passionfruit smoothie. Thank you 🙂 It was something different haha.